The company's energy-related products could see slowing growth if energy prices keep falling. Shares of mini industrial conglomerate Roper Technologies (NYSE:ROP) declined 10.4% last month, according to data provided by S&P Global Market Intelligence. The fall followed an otherwise impressive year for the company. Full-year guidance was raised in each quarter in fiscal 2018 and management now expects more than 7% organic revenue growth for the full year compared to an estimate of 4%-5% at the start of 2018. Although there was some sad news -- like the death of Roper's highly regarded CEO, Brian Jellison -- it was a pretty good year overall for the company. So why did the stock fall in December? 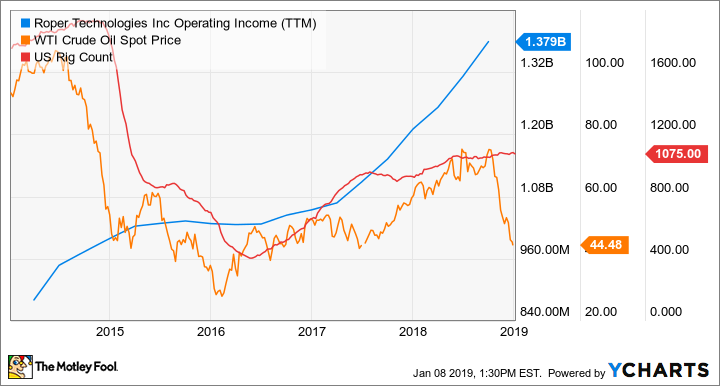 Aside from the general market sell-off last month, investors may have taken a dim view of Roper's exposure to capital spending in the oil and gas industry. A cursory look at Roper's end-market exposure shows that the RF technology and software and medical and scientific imaging segments are far larger in terms of profitability. However, the key point is that the energy systems and controls and industrial technology (which contains significant energy exposure) segments have been growing profits at much higher rates in 2018. Both grew year-over-year profits by more than 25% in the second quarter and at a similar rate in the third quarter. In other words, expectations have been built into Roper's earnings on the back of substantive improvement in energy-related spending. Data source: Roper Technologies presentations. Chart by author. It's not that Roper has reported anything unsettling in its energy-related revenue. Rather, the market is looking at the decline in the price of oil from the mid-$70s at the start of October to around $44 now and concluded that capital spending in the industry will inevitably start to slow. Of course, much of the reason behind the fall in energy prices relates to speculation around the economy in China and the ongoing impact of the trade conflict with the U.S. There still isn't any certainty that it will be resolved. If the price of oil stays low, then profit expectations at Roper are likely to be taken down, but it's worth noting that its absolute exposure is far less than many other industrial companies. Furthermore, during the period of protracted weakness in the price of oil from mid-2014 to 2017, Roper still managed to grow its overall operating income. ROP Operating Income (TTM) data by YCharts. Of course, the question is what sort of valuation should Roper have if energy prices are now set for sustained weakness? It's hard to tell right now, but the market has wasted no time in selling off the stock, and that's why it fell so much in December. Check out the latest Roper Technologies earnings call transcript.